The past couple of days I have been doing master classes and working with students into the area of sound. I love working with others to see what they are thinking. It is also so confirming to me how where our attention (consciousness) is located shapes the energy pathways and circuitry that become the acoustical theater of where are sound resonates into and out from. When asked about where sound comes from or what makes our sound, most people said air. Others said the heart area. I said air needs a vibrating structure to vibrate into. 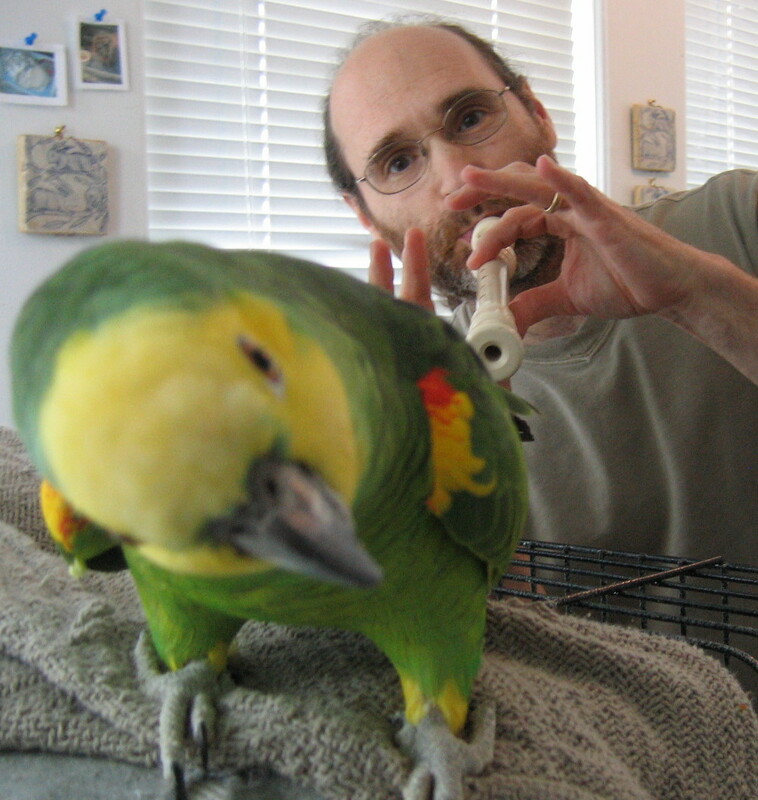 This is called the embouchure. Sound consists of vibration. It is vibration. Air is the movement which moves across our lips causing them to vibrate. *When people were asked about what they want in their sound, some of the words that came up were, rich, open, clear, sweet, supported, articulated, broad, relaxed, emotion. I added height, width, depth and projection. Here is where I did some experiments with three dimensional sound exercises having people focusing their minds in different directions. The results were very interesting. Some people's sounds became more alive when they thought of the sound coming from in back of themselves. Others from above their heads and others from the sides. These are a few things that affect sound. The other one of course is the nature of the music one is playing. I made a video this summer about playing with sound. You can play with sound like a child plays with play doh. And trying some of the various exercises expands our concept of sound and adds DIMENSION and PRESENCE to the sound. Sound can be elastic and I understand at first students will want to get a stable and focused sound. It is important to keep in mind that stable and solid do not have to be made out of cement or steel. There are the elements to consider. Some sounds are more water in nature, others earth, others air and others fire. Of course we can all have control to incorporate them all into our music making but we will have a 'natural' inclination towards one or a combination of a couple of them. Playing outside can be one of the great ways to work on getting a three dimensional sound. Lots of space to fill in all directions! 18 years ago, from 10pm to 2am on November 17th, 1993, in the chorus room of Symphony Hall in Boston, about 14 trombone players gathered not knowing what they were in for. Either did we. It was the first Frequency Band gathering to ever happen. The Frequency Band in this form, came into the world. It would be hard to describe the night that took place in words. To say it was a venture into the unknown and yet known, would be true. To say there were atmospheres of incredible potency of ancient and never happening before appearing would be true. To say it was magical, mystical, profoundly deep would be true. To say that a great 'something else' liked it would be true. To say that it touched deep into the human enigma would be true. The music of the first night, was written from a connection to different colors, to ancient Egypt, well being, the mystery of time and other topics. But we did not just play them. It was how we prepared and tuned ourselves to play them. It was in the integrated spirit of sentimented- technology. Technology for a very needed purpose. To help maintain in the record of human history, the importance of the living Art. As my wife and co-founder and director of the Frequency Band, Carol Viera so eloquently says, "Music is the wrapping paper for the essence that is inside of it." And "The most important instrument is the human instrument." The Frequency Band is first and foremost a human endeavor. The first principle of the Frequency Band is a Unity Born of Humanity. The tuning is to the "A" of attitude appreciation and awe. Without this as a living fabric of the environment, the Frequency band will not appear. It will not be invited. We don't use metronomes and tuning machines. We tune according to connection. The greater the connection the greater the tuning. The greater the tuning the greater the connection. The Spirit of the music comes first, because that is closest to the heart of the human. The human is more sensitive and powerful than any man made machine. It is a matter of education and application that activates the latent human potential that is dying to get out and be free. I am honored and humbled to be instrument to to this very special life. May I always be tuning and fine tuning myself to be a better receptor and translator of what "It" wants. A special thank you to all who have been a part of it in one way or another. Whether you are in a major symphony orchestra, a teacher, a free lance artist or a student, the Light shines on all. Cultural position is not the measuring stick of success in the Frequency Band. It's all in the sentimented spirit of wanting to be included and transmitting it into the world. FOR THE LOVE THAT IT SHOULD BE SO. Greatest gratitude to the special humans and lives that influenced Carol and myself with their wisdom and love of Life. We will keep on keeping on. It's amazing how much detail someone will give something technically. Some people are really geometry like in their approach to phrasing for example. That form of phrasing is mechanical if it is not empowered by another motive. Not wanting to stick out is intelligent only if it is musically based. Not wanting to stick out because one does not want to draw attention to oneself is 'safe' and certainly not always musically sound. How much detail and specificity is put into creating the atmosphere of the piece? Not a lot generally. Tuning into the spirit of the piece and first of all discovering it does not mean one is deviating from the technique. A Mocking bird can make several sounds that are similar to other birds and animals but they are imitations. People who are knowledgable in the authentic calls of other birds can hear and/or feel the difference when the Mocking bird goes through their impressive 'list' of bird excerpts. It is the same with musicians. I sincerely hope that there will be those that can always tell the difference. Now, having said that, there are people who genuinely play dry, others who play more wet, some who are mentally based and some who are more emotionally based. These are just a couple of examples and there are many various combinations of all of these mixed in with other variables. When it is REAL it is REAL. What is is until it is another way. My concern is this 'audition ready' government which is not where music originates from. 'Audition ready' is a skill for a commercial end. Which I know can be a very demanding 'science' and discipline. BUT, will there be room for the other side of music to actually enter into that confined space in a organic living way? That is the vital question to ask. At this point in time and from what I have witnessed, I am not convinced that it does. A more integrated approach with the formula music + technique = Art, will be more satisfying and fulfilling in the long run. From that foundation, going into audition training mode can be assistive to the refinement process if done with an integrated mind and heart. There has been a lot going on these past few months, as a I wrote a few blog posts ago. Last night (Friday, November 4th), I did a fun and potent recital with John Faieta at Boston Conservatory. We performed works by Bartok, Mozart, Telemann, Blazhevich and Bolter (myself)! The audience was asked to view the recital as a TV show and to sit back and watch it. You had to be there to get what I'm saying but there was lots of humor, humanity and profundity.. and a very good turn out as well! Bravo to John Faieta for his fine playing and willingness to be a part of this journey! The amazing photo seen here was put together by my wife, Carol. 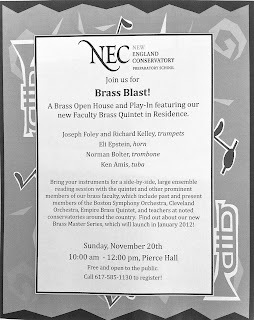 This coming weekend (Saturday, November 12th, and Sunday, November 13th), there will be a Brass Symposium at the Longy School of Music in Cambridge. This symposium, a first at Longy, is open to middle school, high school and college students. It will be a very full presentation, starting on Saturday at 4 PM with a concert by the Longy Faculty Brass Quintet featuring Steven Emery trumpet, Redline trumpeter Kyle Spraker will be assisting, Kevin Owen on horn, myself on trombone and Ken Amis on tuba, Redline Brass Quintet who are all in the Artist Diploma Program at Longy, Longy prep faculty and a combined large brass ensemble of faculty and students with me conducting. Following the concert, I will be conducting a rehearsal with all the participants and faculty in a mass brass ensemble that will be the grand finale to the many events that will be happening on Sunday. Before that, on Sunday, there will be master classes, brass topics discussion, breaking into individual instrument classes, playing opportunities for all to play a solo or excerpts and get feedback. Lots of informative and inspiring events! PLEASE NOTE: IT IS VITAL THAT PEOPLE REGISTER ONLINE ASAP, MEANING BY WEDNESDAY. THE FEE COVERS MEALS AND SNACKS. If they don't have enough applicants at least 50 they say, the event will be cancelled. So register now if you are interested. To register, visit: Longy Brass Symposium or call 617-876-0956 ext 1760. P.S. I am not sure if there will be the possibility to just walk in at the last minute. I really apologize for this and other and oversights in how the event was set up but since this is the first time tis is happening, i don't the PR people quite knew how to handle the details. Hopefully, next year will be it will be advertised more effectively and clearly. 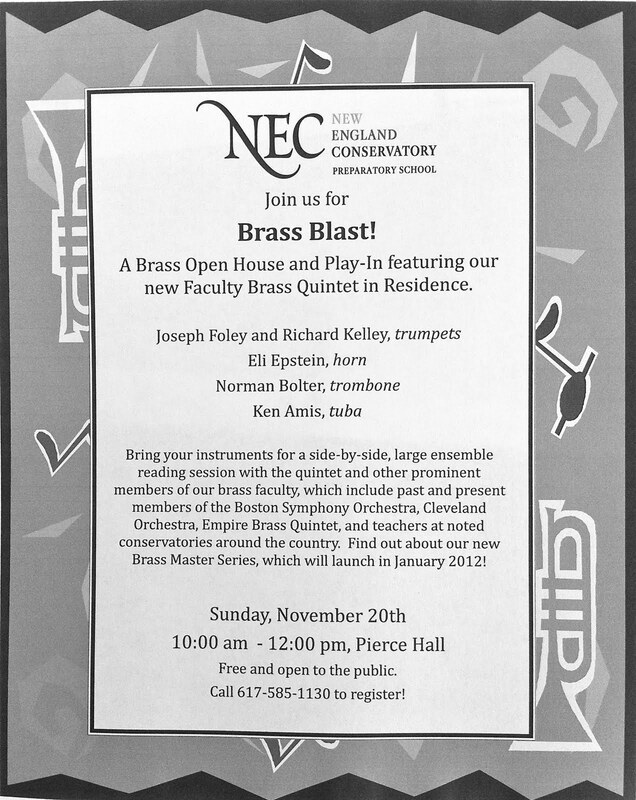 On Sunday, November 20th from 10 AM-12 PM in Pierce Hall at New England Conservatory, there will be a Brass Blast at the NEC's Prep division. It will feature and premiere the new Faculty Brass Quintet! This quintet consists of myself on trombone, Eli Epstein on horn, Joseph Foley and Richard Kelly on trumpets and Ken Amis on tuba. BRING YOUR INSTRUMENTS FOR A SIDE-BY-SIDE READING WITH THE QUINTET! It will be a fun and exciting time for all middle school and high school students! It's FREE and open to the public! Call 617-585-1130 to register.